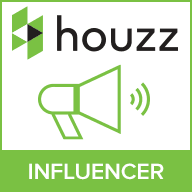 The start of a new year can be an immensely fast paced, yet thoroughly exciting period, with people looking to change their home to suit their new found passion for life, but it’s always important to make sure you make the changes in the right way to avoid any inconvenience. One of the biggest resolutions for the new year is a change in diet, whether that’s to lose weight and get back into shape or perhaps just to lead a healthier lifestyle in general, but plenty of people might be discouraged if they don’t find their kitchen to be an enjoyable space to cook and eat – that’s where we step in, helping you to create the perfect environment in your kitchen, making the idea of those early morning breakfasts and hearty evening meals an exciting prospect rather than a dull, drab, and daunting chore. One of the best ways to revitalise your kitchen can be to upgrade the light given to the kitchen island and breakfast bar, so check out our top picks and let us know what you think in the comments section! 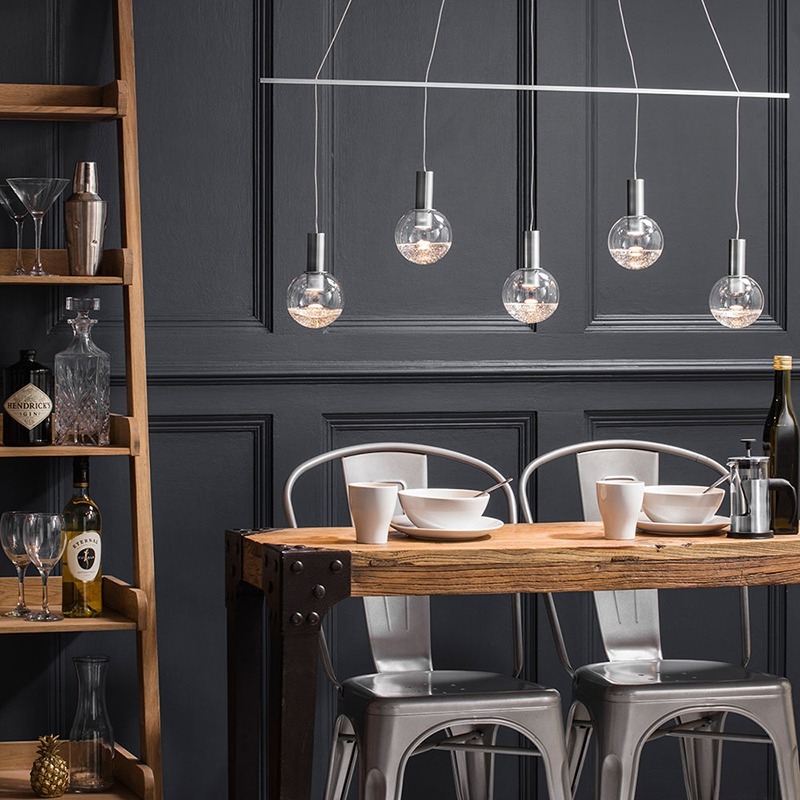 When it comes to modern kitchen island lighting, chrome tends to be the go-to finish – it’s got a clean, simplistic look that just works perfectly in those kitchen areas – so naturally we’ve got plenty of fashionable chrome choices when it comes to pendant bars. 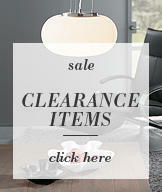 We’ve put a few of our favourite chrome pendant bars below, with a selection of different designs to suit any décor. Our first pick is one of our most popular pieces, the Bulla 3 light bar – a unique urban piece featuring 3 droplet shaped lights, featuring integrated LED for an energy efficient form of illumination. 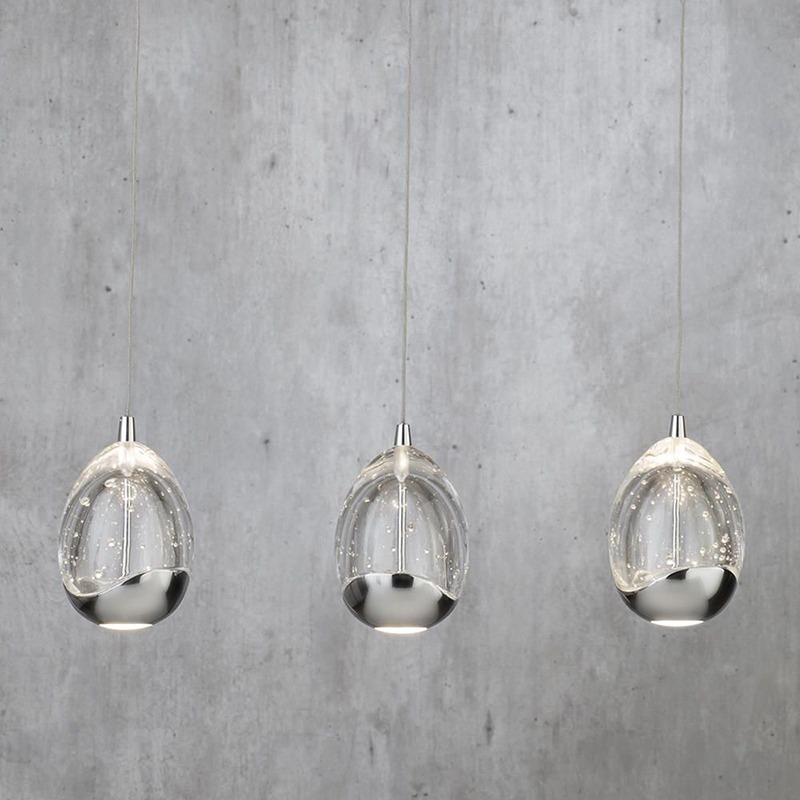 Each droplet encases a bubble effect that catches and bends the light for a softer, inventive glow in your home. The underside of the droplet has a more direct beam shining straight downwards, which is probably what makes this an ideal kitchen island lighting idea, with its ability to offer effective light to the worktop. A more simplistic option, Krypto-Lampada is available in 2 different sizes and has a minimalistic design that can seamlessly illuminate any kitchen space! 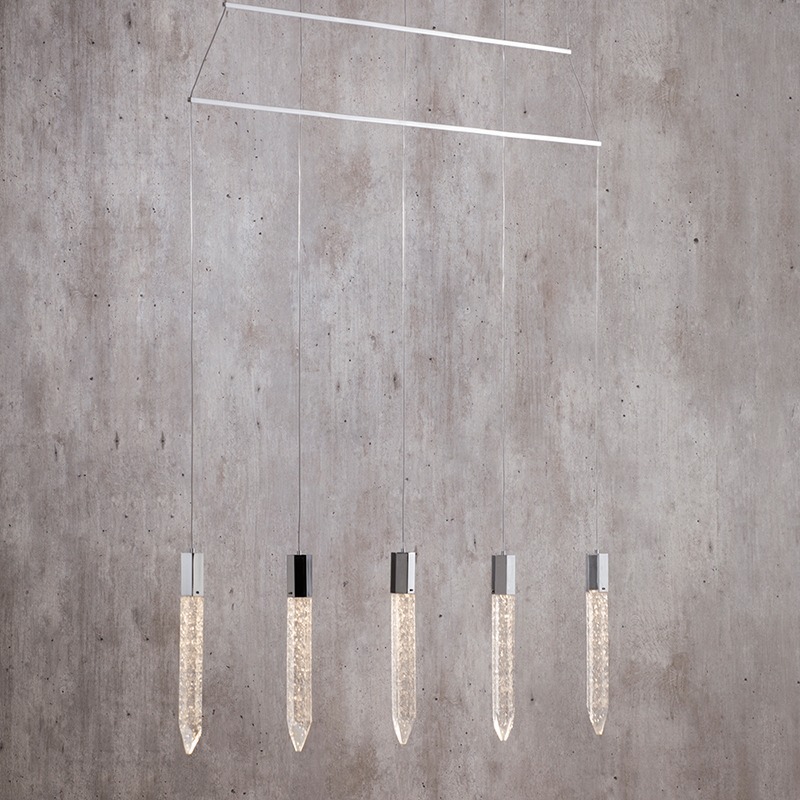 The smaller 5 light piece features 5 lights in a linear pattern, hanging next to each other to give a longer spread of light. 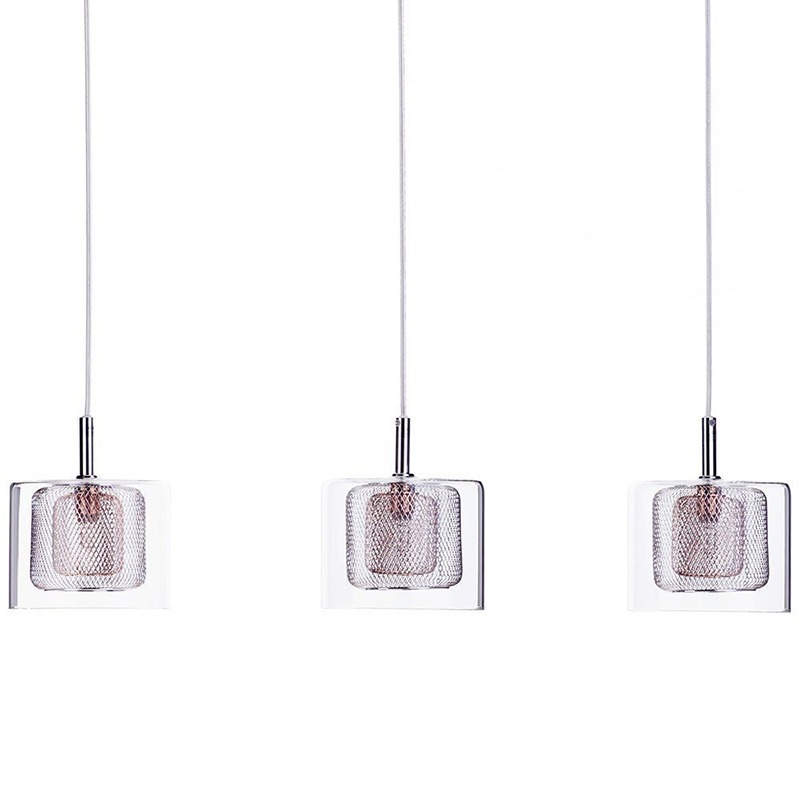 The acrylic shards feature integrated LED, with the textured design giving a more detailed effect to the light. The larger 13 light edition has the lights hanging in a more layered structure, to give a wider spread of light across the kitchen island. This larger fitting is a great choice for kitchens with higher ceilings looking for a bold statement piece to add style to the décor! 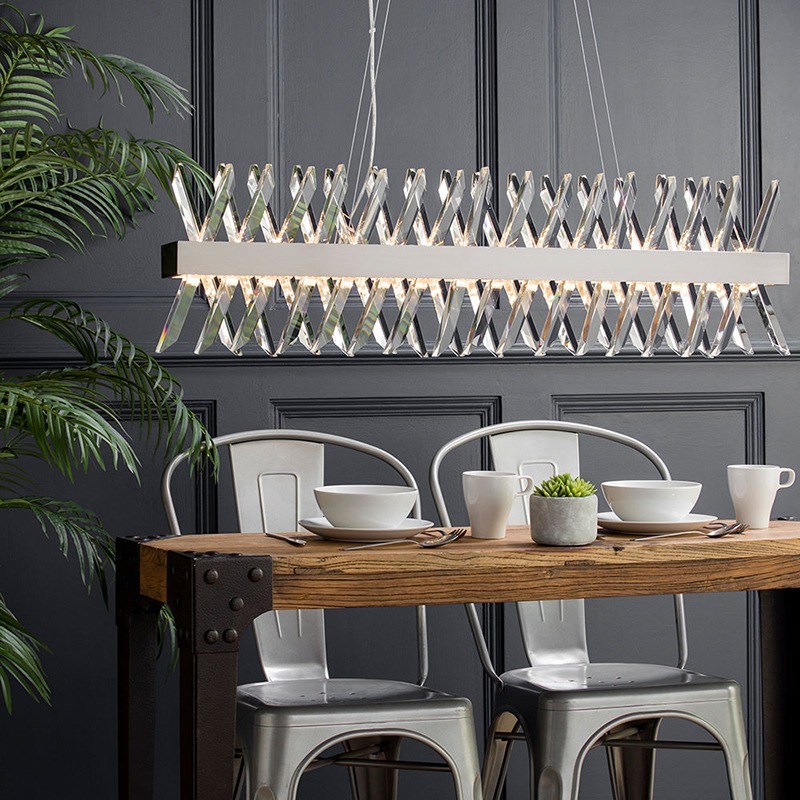 Probably the most elegant of our 3 chrome offerings, the Ice 4 light showcases a set of crystal shades, each individually hanging from a sleek ceiling bar, creating a showstopping sense of sophistication over your breakfast bar. The crystals surround each of the lights, giving a soothing sparkle to the light which makes spending time in your kitchen a joy rather than a bore. Another common finish for the kitchen is gold, continuing the clean metallic look of the chrome theme whilst adding a classy twist to the look for a more upscale, extroverted tone throughout the room. There’s an eclectic mix of designs in our catalogue when it comes to gold pendant bars, so there’s a really varied selection to choose from. Our first gold offering, Tozzo is an integrated LED pendant bar that brings energy efficient lighting directly into the heart of your kitchen. The stylish piece features faceted glass slabs surrounding the rectangular structure – these diffuse the light for a softer, more attractive shine in your home. The light also illuminates upwards and downwards, which fills the entire room with exquisite lighting. 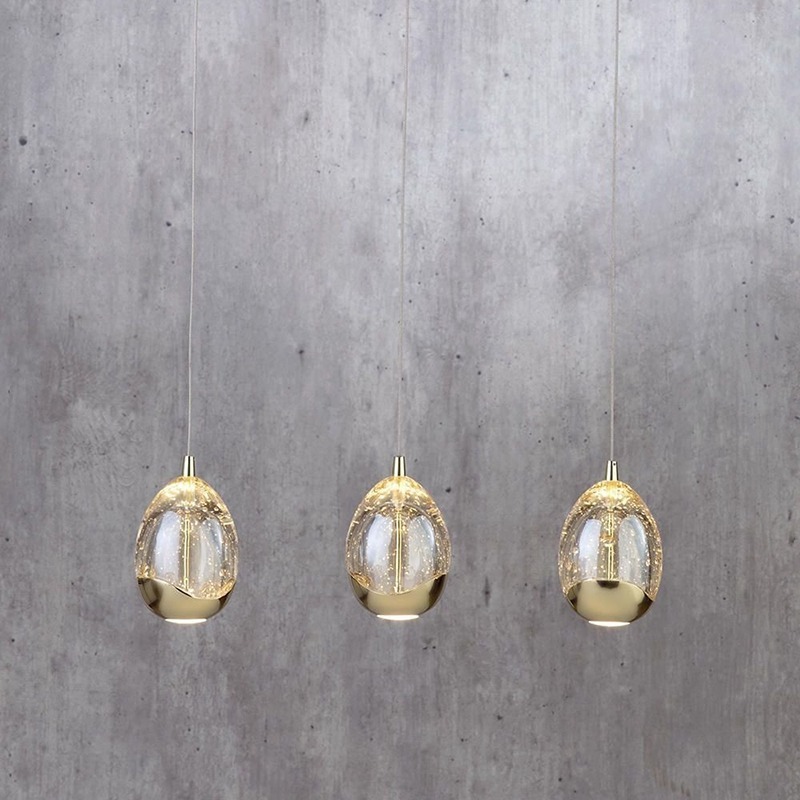 A slight variation on the chrome Bulla fitting that was mentioned earlier, the Gold Bulla 3 light is a stunning piece, combining elegance and contemporary modern style brilliantly. The bubble effect glass looks fantastic as it catches the light, with the hanging style making it a perfect fit over a breakfast bar. One of the boldest pendant bars we have, the Krypto-Lampada 13 light looks absolutely gorgeous in gold, there’s no debating it, but it’s so much more than just a pretty picture – it’s practical, perfect for high ceilings, and can completely revitalise any kitchen island! The integrated LED piece has a staggered layer structure, which allows each of the textured shard lights to hang in its own space of offer even, effective light to the space surrounding the fitting. Now, if gold or chrome just aren’t for you, there’s no need to panic as there’s still plenty of stylish, practical options when it comes to lighting up your kitchen island or breakfast, with a selection of different colours and finishes available to suit any kitchen décor. These unique pieces are perfect for giving an unusual twist to your kitchen spaces! 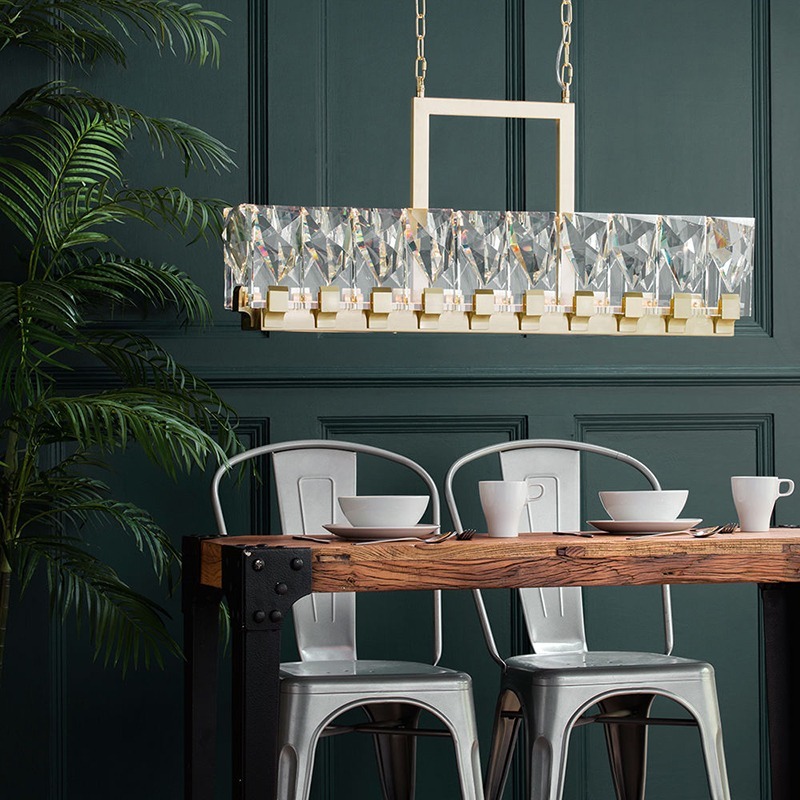 Our Flusso pendant is the ideal piece for anyone looking for bold statement lighting in their kitchen interiors. The contemporary satin nickel design features crystal rods angling against each other, catching the light for a softer, more atmospheric glow. The long, slim design makes the integrated LED Flusso pendant bar a perfect fit over a breakfast bar, helping you to start the day the right way every morning. With the Splendere 5 light pendant bar you find a bold minimalistic piece with a unique elegant twist brought by the glitter glass shade, which catches the light to give a gorgeous sparkle across the surrounding space. 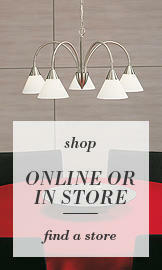 The 5 lights hang in a chevron formation, giving a stylish look and a practical spread of light to the kitchen island. Integrated LED light ensures that the light is as effective as possible, with two stylish colour options available to suit your decors – satin nickel and brass! 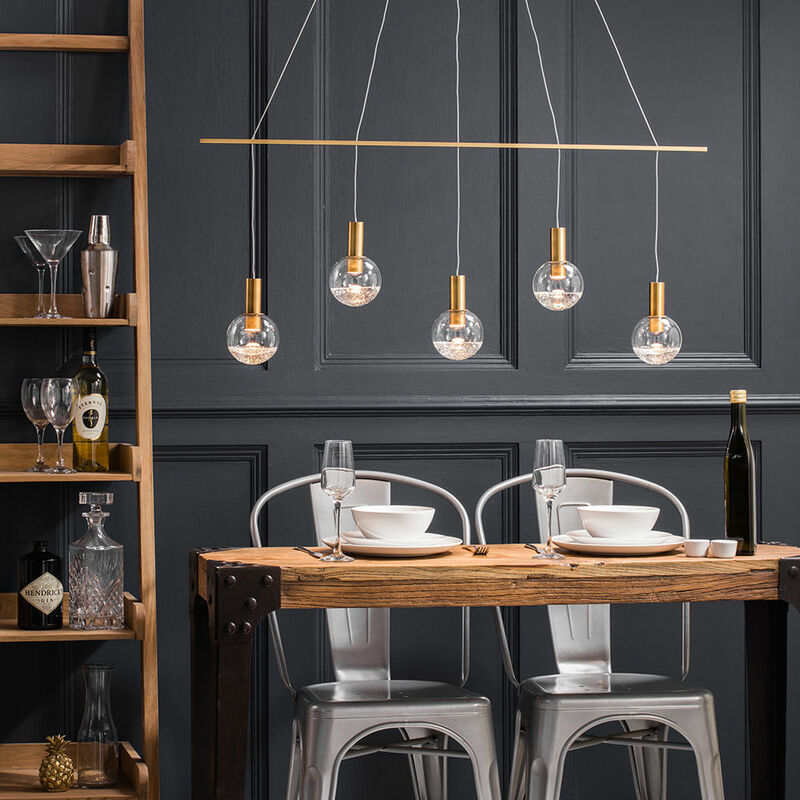 Next is one of our most on-trend pieces, the Corona 5 light pendant bar in copper, which incorporates the incredibly popular industrial copper tone into your home alongside an elegant, minimalistic structure that is sure to bring sophistication into your kitchen spaces. 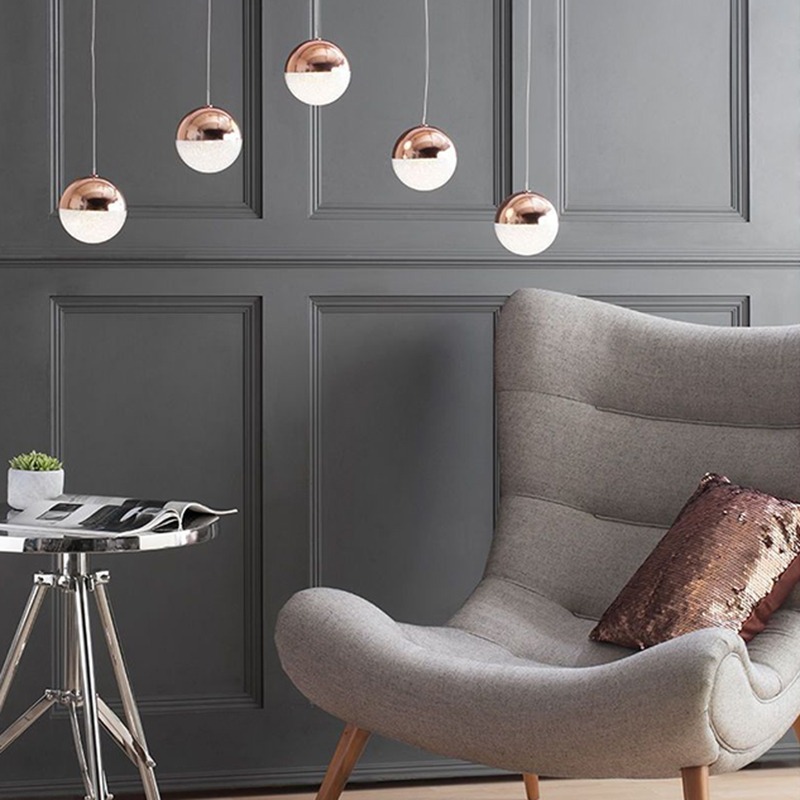 The ball-shaped light has a half copper, half sparkle shade design, which surrounds the integrated LED light to give a stunning shimmer and shine to your kitchen island or breakfast bar. The 5 lights hang directly downwards in a line from the ceiling plate, giving them the ideal shape for use over your kitchen surfaces. 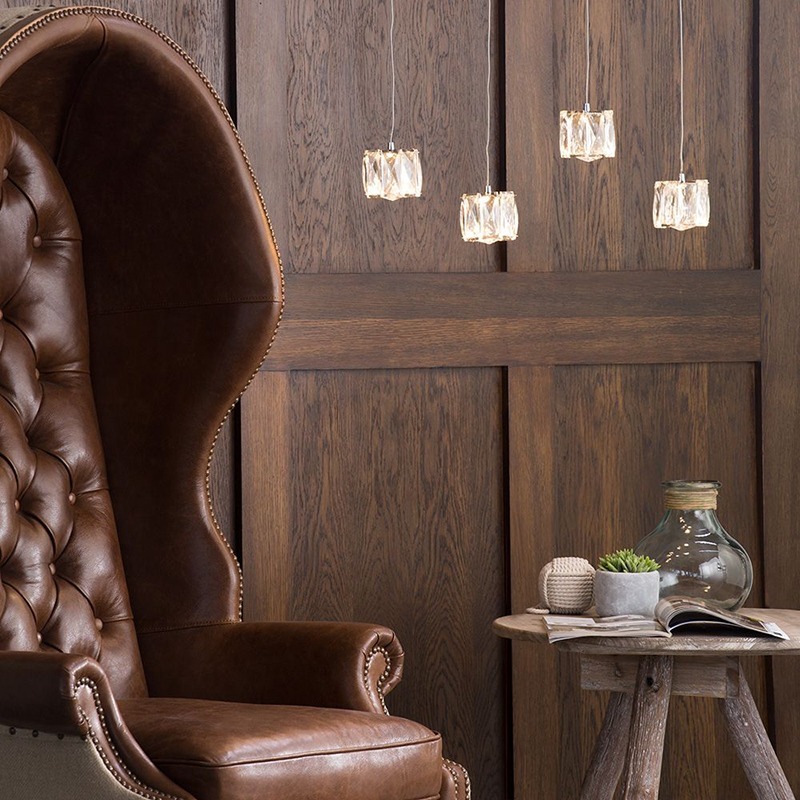 This pendant bar comes from our Heritage collection, which combines modern design with a spectacular vintage image to create a stunning industrial vibe in your home. 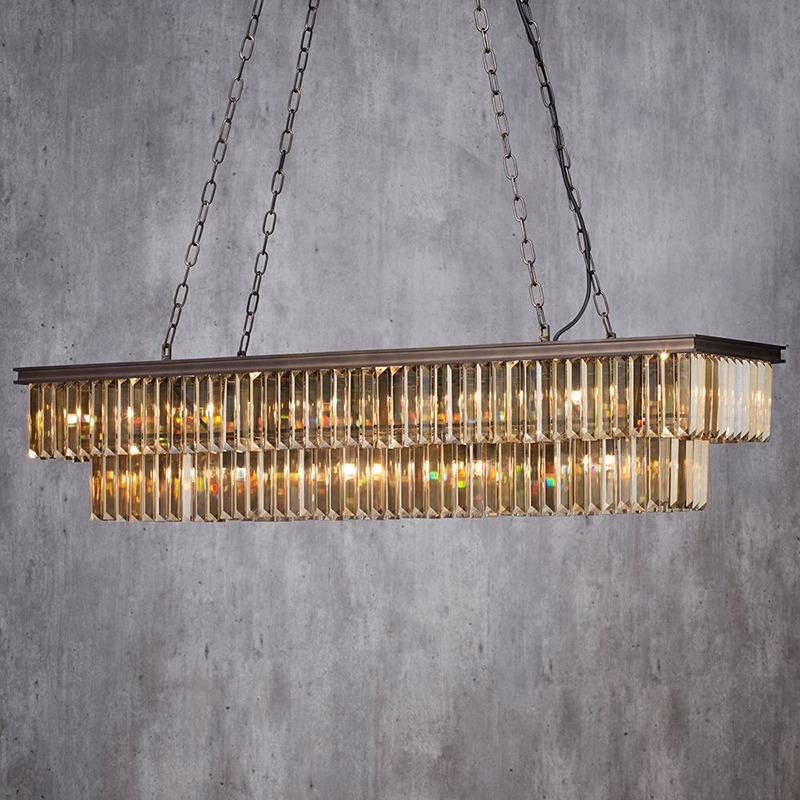 The Ingot 9 light bar features 2 tiers of crystal prisms hanging from a rust coloured frame, adding to the raw industrial look of the fitting. 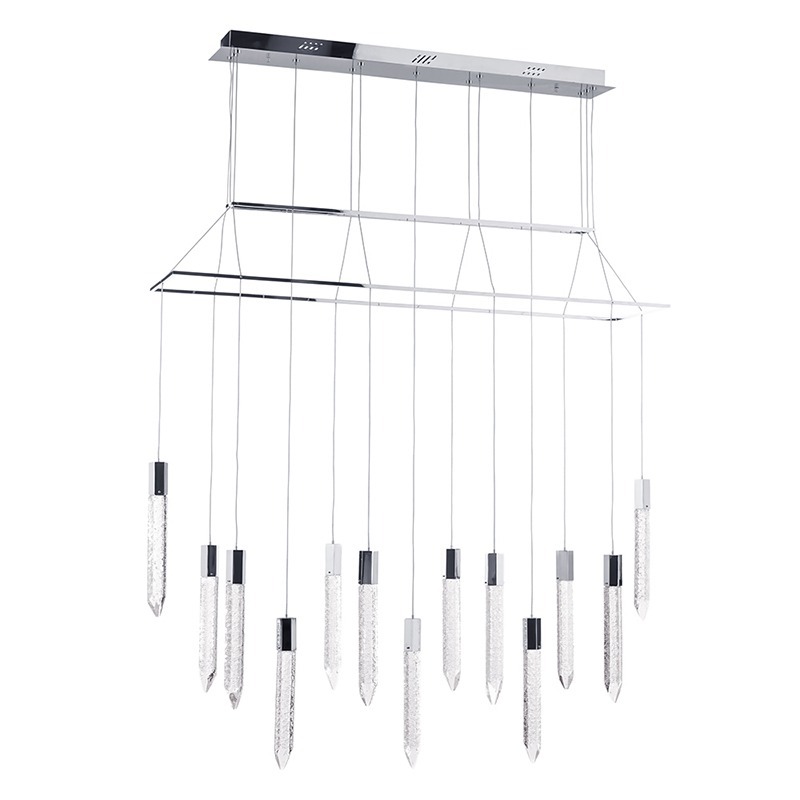 The added practicality of the adjustable chains ensures that you can tailor this light to suit any ceiling height to give fantastic light to your kitchen island. Finally, our last offering is another industrial inspired fitting, incorporating a combination of metals and glass for a unique modern image. The Dijon 3 light pendant has 3 individual pendants hanging from the same ceiling plate, each of which is surrounded by a triple shade design – one inner copper mesh shade, a central silver mesh shade, and an outer glass shade to diffuse the light for a softer glow. Let us know what you think about our kitchen island/breakfast bar lighting options in the comment section below and be sure to come back to our blog page for more hints and tips on the latest lighting trends.